Although blood stains on a carpet sounds pretty gruesome, it happens more regularly than you might think. From minor problems including nose bleeds and cut fingers through to other injuries such as head trauma, blood can be extremely problematic to remove. Firstly like all stains, speed is of the essence. Clearly, if there’s an injured person then they need to be dealt with first but assuming that the person is now in good hands, then it’s best to get to work on the stain as quickly as possible. The reason is that if it’s allowed to penetrate down into the carpet fibres it might be that it can only be removed using specialist cleaning equipment. Here are two cost effective methods that you can use. Fill a spray bottle with cold water. It’s very important that the water is cold, because if it’s hot, then it might set the stain into the carpet. Spray the water liberally onto the affected area and leave for a few minutes. Next take a clean, dry, lint-free cloth and place on top of the stain. Then start working your way from the outside inwards blotting as you go. Doing it this way will prevent the stain from spreading. When the stain has disappeared, use a dry towel to absorb any excess moisture, then use a small portable fan to blow air onto the area so that it dries completely. Finally give the carpet a good vacuum to bring the fibres back to life. For more stubborn blood stains you might want to make up a mix of 1 tablespoon of washing-up liquid with two cups of cold water. Next, soak a cloth in the solution and apply it to the stain. Then using an old toothbrush, gently brush the affected area from the outside of the stain towards the centre. Avoid scrubbing hard as it will force the blood deeper into the carpet fibres. The next step is to rinse off the soap solution by blotting the area with a wet cloth. Then using a lint-free, dry cloth put it on top of the stain and press down. You might want to apply a makeshift weight such as a tin can or bag of sugar to help with absorption. After a few minutes remove the weights and then blow-dry with a portable fan. Again the final step is to vacuum to restore the fibres of your carpet. Cuts and scrapes are an inevitable part of every household, especially ones that involve kids. At one time or another, your carpets would eventually get bloodstained. Blood stains are the most unattractive of all stains. Carpet Cleaning Kings can remove blood stains from your carpet when needed. Never let blood stain sit on your carpets. Blood stains are embarrassing whether it is on your furniture or on your carpet. We bring you good news; Carpet Cleaning Kings can help you clean up and remove blood stains from your carpets once and for all. So, don’t throw out that blood-stained carpet away. Backed by years of experience, blood stains from your carpet can be removed in no time at all. The sooner you call in an expert to treat the blood stains, the better your chances of saving your carpets. Carpet Cleaning Kings is your one-stop cleaning company for all your cleaning needs. 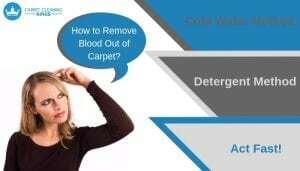 Call us today to have your blood-stained carpets cleaned. We have the proper equipment and use only the best cleaning solutions for your expensive carpets. If you or someone you know has blood-stained carpets, experienced carpet cleaning professionals here at Carpet cleaning Kings can help you. If you’re having a hard time removing blood from your carpets, carpet cleaning experts at Carpet Cleaning Kings would love to do it for you. Call today and learn more about the wide range of services that we can offer you. Are Your Carpet Cleaning Habits Causing Harm To Your Pet?